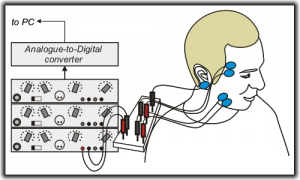 Over the past decade, a series of projects has supported our interest surface Electromyography (sEMG) for examining the masticatory muscles during eating. The first step in the digestive process is chewing: by breaking food down, its effective surface area is increased, and this promotes action by enzymes in the mouth and further along the digestive tract. Our aim has been to develop sEMG as a quantitative and objective tool for measuring aspects of masticatory function. Project outcomes have been reported in a collection of journal papers and press articles. For instance, in a recent study on satiety, we used sEMG as an accurate and precise tool for recording chewing behaviours. The results, reported in Appetite, suggested that taking more chews per mouthful of food in “eat-as-much-as-you-like” meals, reduced overall calorie intake by ~12%. Examples of our EMG data are available for download here (zipped csv text file). These data were obtained from the right-masseter muscle group in volunteers performing prescribed “chewing movements”, as reported in J. Electromyog. & Kinesiol. 13 (2) 197-207 (2003). Watch a video introduction to our work here. Smit H., Kemsley E. K., Tapp H. S., Henry C. J. K.(2011) Does prolonged chewing reduce food intake? Fletcherism revisited. Appetite. Kemsley E.K., Defernez M., Sprunt J.C., Smith A.C. (2003) Electromyographic responses to prescribed mastication. Journal of Electromyography and Kinesiology 13 (2) 197-207. Example data available Download a subset of the data (zipped csv text format) used in this paper.